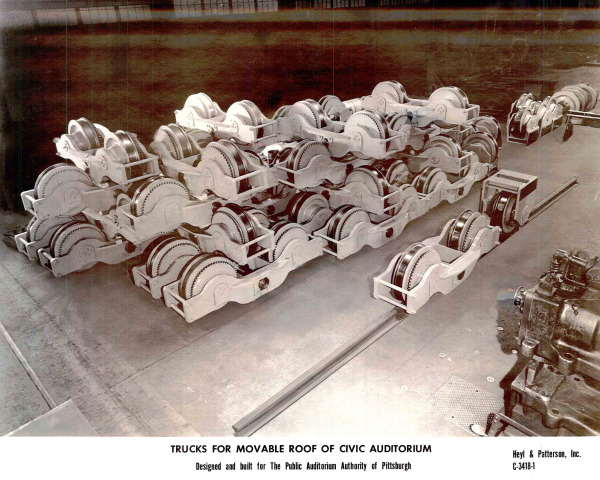 The year was 1958 and the Public Auditorium Authority of Pittsburgh began construction on the Pittsburgh Civic Light Opera, or better known as the Civic Arena, Mellon Arena or to most Pittsburgh natives, “The Igloo.” What was noteworthy about this endeavor was the plan for a 1350 ton retractable roof. The problem of the retractable roof was posed to engineers at Heyl & Patterson, who responded with a new design and a roofing solution. 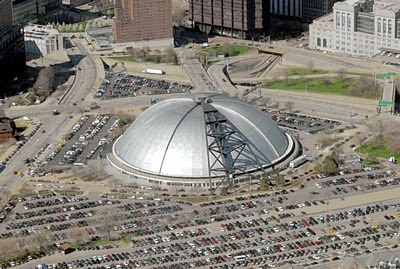 Heyl & Patterson provided the wheels, frames, chain drives, equalizers, gear motors and brakes to move and support what was then the world’s largest stainless steel dome. When the project was completed in 1959 the roof could be opened or closed in less than three minutes, which is quite a feat. From roofs to railways Heyl & Patterson has been there to provide innovative ideas and solutions. Some might say that the sky is the limit, but we have been there too! Although H&P usually engineers equipment for land and sea, in the 1960’s Heyl & Patterson engineered blast defectors for NASA’s launch pads, as a solution to redirect rocket exhaust after ignition. Large equipment is what we’re known for, but advancing efficiency and simplifying systems is our bread and butter. Our Field Service Representatives have travelled the globe to provide inspections and insight on improving bulk and thermal processing equipment regardless of the original manufacturer. In addition to inspection services, Heyl & Patterson's Field Service offers maintenance services in order to extend equipment's useful life. Field services include consultation on parts installations, outage planning, maintenance recommendations, upgrades and start-up assistance. In addition, Heyl & Patterson offers engineering studies to monitor equipment and maintain peak operating performance and reliability. Whether a user is trying to prolong the life of their equipment, increase capacity or make upgrades to improve workplace safety, our team of expert engineers will create a solution to improve existing equipment, structurally, mechanically and electrically.